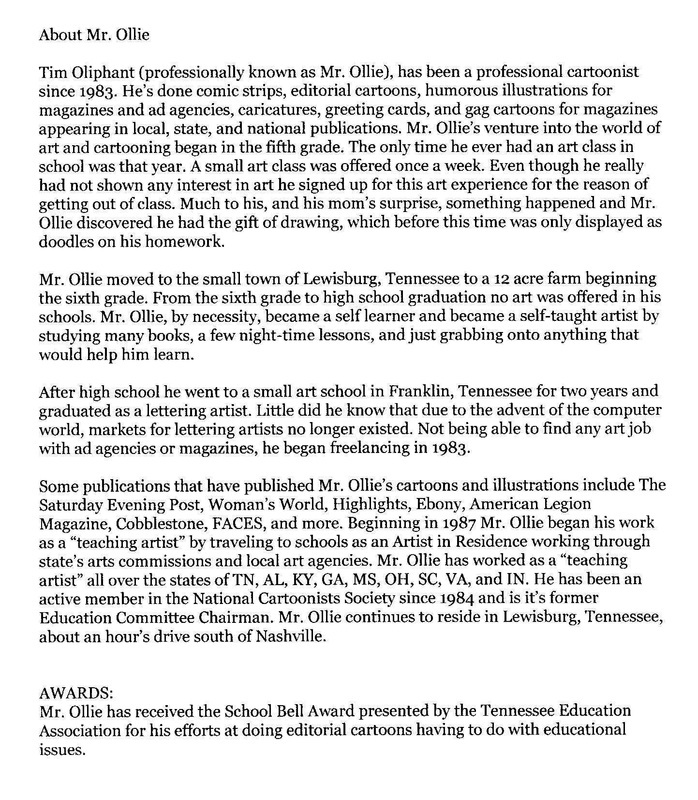 Mr. Ollie's educational programs include "Cartooning With Mr. Ollie" and "Mr. Ollie's Writing and Illustrating". Information is included here. Mr. Ollie's educational programs are for K-12, Resource, Special Ed, any grade, any level of education, and it's very user friendly for students and teachers. Since 1987 Mr. Ollie has been a teaching artist traveling to schools, libraries, museums, and arts centers. He's taken his workshops and artist residencies all over Tennessee, Alabama, Kentucky, Mississippi, Georgia, South Carolina, Indiana, Ohio, and Virginia. For rates, availability, request,questions, concerns, just contact Mr. Ollie. Let's talk, everything is flexible and we can work out together whatever your needs may be.